I was oh so nervous as I reached Rare's A/W blogger event; I was hot and bothered after getting lost, the wind had completely ruined my hair and my makeup had melted off. Basically I looked like a complete tramp, ha. But when I arrived I was welcomed by the lovely Almina (thank-you for inviting me) and her colleague, whose name I can't remember (sorry!) and they made me feel really at ease. For a while I mooched around taking pictures and looking through the rails of wonderful clothes by myself, then many lovely bloggers who I recognized slowly filed in by one by one. I met Jen (doesn't she look beautiful in the picture above?) from The Style Crusader, Saskia from Not Just Medical, Abi from I Am Abimarvel, Daniella from Couture & Crumpets and the wonderful Jill from Polka Dot. I hope I haven't forgot to mention anybody. I put practically all of my confidence issues and worries aside and had an amazing time meeting new people, playing dressup and having lovely conversations. Anyway, about the dress. Isn't it gorgeous? 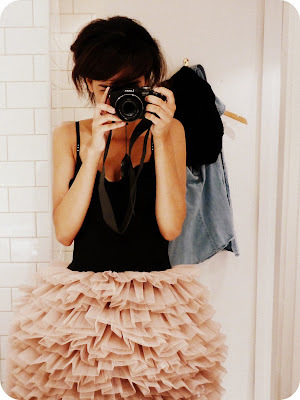 I felt like such a ballerina in it! It's from the Rare Opulence collection and is definately one of my favourite pieces. 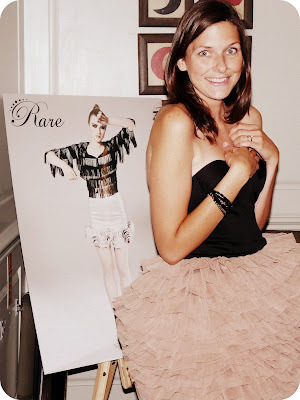 Rare were also extremely kind with their gift bags, check out Platform Princess' post to see the dress we were all kindly given, I can't wait to wear mine! This was just a quick post, I shall post more on the event over the next few days. Love, Jazzabelle. P.S. Thank-you for all your lovely comments! Hey, I must've just missed all you guys there, I got there in time to see Jackie though ( discovered your blog through your comment on hers). Your photos are lovely, great colours, and you picked the best dress...I didn't know we could try them on or I would've been straight in there! That dress is absolutely beautiful on you. Oh you do look absolutely gorgeous in that dress. Glad you enjoyed it! It was so nice to meet you yesterday! You have a great blog and I don't know what you mean because you look gorgeous in photographs and in person as well! I love these pictures. Looking forward to seeing more! Also hopefully I'll be putting up pictures of you in the next few days! The dress and shoes are beautiful. Te he, wow you are one lucky ducky! Sounded absolutely wonderful, and that dress! Gosh it's perfection! That dress is amazing! I'm so glad you had a wonderful time! You're so so lucky! That dress is totally lush, on both yourself and Jen. She is so lovely, Its great you got to meet up with her. I am sad that I missed this event, it looks so fun. So sad I didn't get to meet you yesterday. Your shots are gorgeous; as are you! You look like a ballerina, haha. Jen is super cool; so it's great you got to meet her and the other blogger lovelies. can't wait to see you in the white dress. That dress is stunning on you! Well done for having the confidence, and putting your worries aside. I'm soo glad you had a great time :) and that dress is truely amazing! Oh, it looks like such a fab evening! And you look totally and utterly STUNNING in that ballerina dress. It's perfect on you. that dress is stunning, as are you! I read on 'Not just medical' that all of you girls, who attended the Rare press day, loved the wedges. I instead, am absolutely in love with these white studded heels. Arg, I want them! 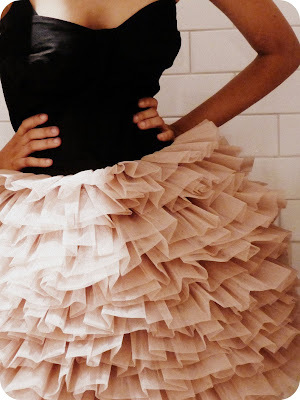 Oh my golly gosh that is the perfect dress!